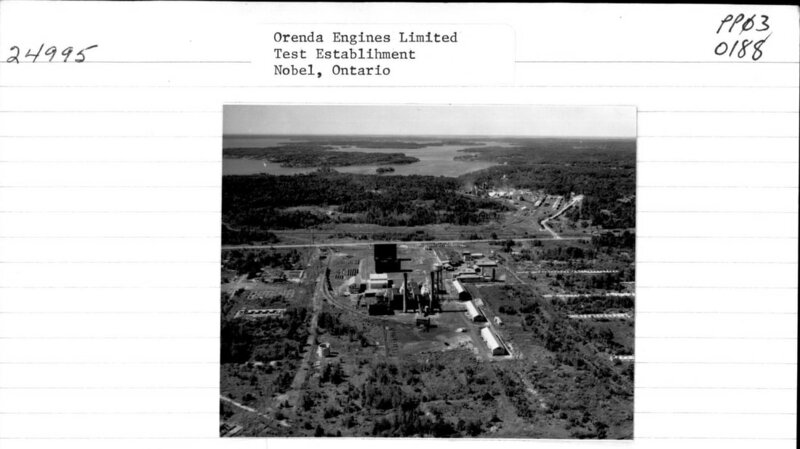 November 2018 My curiosity was peaked recently driving by the Magellan plant on Derry road in Malton; the original Orenda Engine plant has been sold to an as yet, un-named buyer and one of the conditions of the sale was to build Magellan a new plant. The new plant is right beside the original plant on the same property and the only news article I could find explained that it was to make their operation more efficient. For a period of time, Orenda Engines produced some of the best jet engines in the world and the legacy of that period of development has sustained a division of what was once AV Roe until the 21st century. There does not seem to be a whole lot written about the history of Orenda, some chapters here and there in books on Canadian aerospace, and so I've decided to conduct some of my own research to see what I can unearth about this iconic company. As a technical sales rep for machine shops throughout the GTA I hear alot of stories from people in the industry who have relatives or know a friend who worked on the Avro Arrow and the infamous Orenda engines that were to power it. One of the most intriguing urban myths (or is it?) I often hear about is how there was an underground complex built underneath the Orenda plant on Derry Road during the Cold War, so of course, I was determined to find out more about the plant and why anyone would be interested in unloading a factory that was specifically designed for the manufacture of aerospace components, only to move 100 metres from the original. 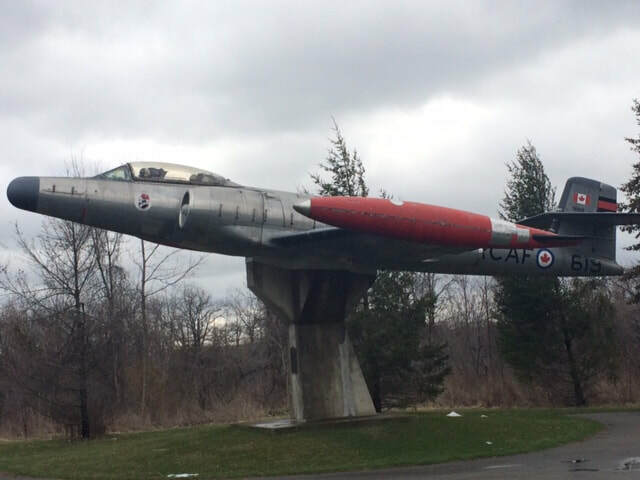 The Orenda plant was the site of the creation of the famous Orenda engines that powered Canada's early jet fighters including the Avro Arrow and CF-100 Canuck. One jet engine design, the J85 became world famous as the powerplant of the F-86 Sabre. Today the plant still continues to manufacture jet engine components and test jet engines as well. Who has bought the original building and what will become of it is anyone's guess at this point but hopefully, the story of the plant will not be forgotten because it forms an historic part of Canada's aerospace history. In addition to the Derry Road location, there was an additional plant north of Parry Sound where engines were tested as well. Thank you for your note about the Orenda Engines plant and its tunnels. I am not familiar with the plant or have any knowledge of it. However, since you are looking for archival material, I am forwarding your email to my colleagues in the archival collections and they may have something related. My history teacher always told me that primary sources of information were always the best to describe historic places and events so reaching out to present and former employees has been a priority. One of my customers runs a machine shop in the west end of Toronto and worked at Orenda as recent as 2002- he was the person who caught my interest in the underground complex stories since I know him and he is credible. He recounted that as night supervisor he had a set of keys to the whole plant, one of which was painted bright red. One night, he decided to find out what the key was to and soon found a door at the back of the plant close to where the old jet test engine building was and discovered it led to a tunnel which incidentally had a lot of historic odds and ends lying about that dated back to the 1950's. I next was fortunate to get in contact with an employee who confirmed the tunnel story and verified that it once allowed employees to traverse all the way to AV Roe on the north end of Pearson Airport-a distance of at least a kilometre away! Of course, construction of the Convention Centre in 1971 by a group of DeHavilland investors would have entailed the destruction of at least part of the tunnel and I have heard stories about some of these being filled in during it's construction. "In response to your inquiry, the Canadian War Museum does not hold any material related to the construction of these plants. There may be several sources where this information may be located. 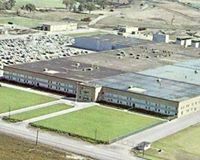 The original plant was constructed by National Steel Car Limited, but expanded when it was taken over by Victory Aircraft Limited, a Crown Corporation, under the Department of Munitions and Supply. In 1945, the facilities were leased to A.V. Roe Canada Limited and purchased outright four years later. 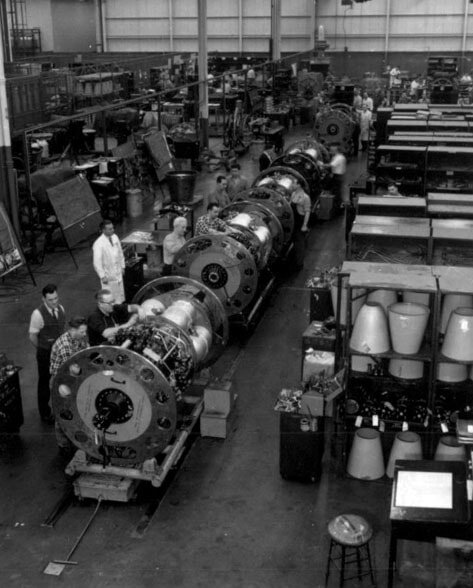 A further expansion of the plant’s facilities occurred during the period it was owned by Avro Canada. A historical background on the development of the aircraft manufacturing facilities is contained in James Dow’s The Arrow. A good summary of the wartime facilities in contained in the History of the Department of Munitions and Supply. These pages have been scanned and are attached. During the period when the plant’s facilities were owned and operated by the National Steel Car and later by Avro Canada, it is thought that any blue prints might have been registered with the Town of Malton. As Malton was later absorbed by the City of Mississauga, it is suggested that you contact the Mississauga Central Library Archives for any information. During the period when it was Victory Aircraft, a Crown Corporation in the Department of Munitions and Supply, any records would be located in Records Group (RG) 28 for the Department of Munitions and Supply at Library and Archives Canada." Hawker Siddeley Group [1962 assumed assets of former Avro Canada]. Dow, James. The Arrow, Toronto: James Lorimer& Company, Publishers, 1979 [see pp. 11-34]. Kennedy, John de Navarre. History of the Department of Munitions and Supply – Canada in the Second World War, Ottawa: King’s Printer, 1950 [D768.15 K35 CWM c.3 v.1][pp. 468-473 have been scanned as an attachment]. Molson, K.M. and H.A Taylor. Canadian Aircraft since 1909, Stittsville, ON: Canada’s Wings Inc, 1982 [Information on Avro Canada and Avro Aircraft Limited, pp. 15-18]. Ozorak, Paul. Abandoned Military Installations of Canada - Volume 1: Ontario, 1991 [UA 600 O967 1991 v.1 CWM]. April 2019 Additional verification that a series of tunnels does in fact exist underneath the Orenda facility comes from a co-worker who has numerous contacts at Orenda. Recently, when visiting the plant he mentioned to one of the management team that I had enquired about the tunnels and was told that, yes, in fact there were numerous tunnels including one which ran underneath the convention centre and another large tunnel that runs all the way to Pearson airport. Hopefully when the sale of the plant is completed, the new owners are not the kind of people who you'd want having underground access to Pearson from a remote location, a few kilometres away!. The history of the company dates back to the 1930's when it was known as Victory Aircraft. I've reached out to Library and Archives Canada to see if there were any records of the construction of the various factory buildings and their reply is presented below. Anyone wishing to assist with discovering more about the construction of the underground components are welcome to review the resources indicated as I do not live close to Ottawa and have not had the time to review all of the documents and materials listed. Thank you for your question to Library and Archives Canada (LAC) regarding records of plant construction of Victory Aircraft Ltd. I apologize for the delay of this response. LAC receives a great number of questions, which causes delays. This file covers the years after the Crown Company was installed in the Malton plant. It could possibly provide information on the plant’s expansion. This file could possibly include a description of the plant from the time it was owned by The National Steel Car Co. In Aurora, you can see that the book is also available in other libraries throughout Canada, as the Toronto Public Library, in the Check Availability section : https://bac-lac.on.worldcat.org/oclc/752006 You can ask for an interlibrary loan at your local library. Unfortunately, I was not able to locate other specific records on the plant construction when it was owned by the government. Copies of material in our holdings may also be purchased through our Reproduction Services with a fee per page. For more information, please consult our site for links to our price lists, service standards and examples of archival references, as well as our online order form. I hope this information proves useful to your research. Thank you for your interest in Library and Archives Canada.